We’re now into the third full arc (or at least the third full installment) of the “Clone Saga” and I think the four-part “Web of Life” is the first indication that there were some serious flaws with the long-term planning of this storyline. It would still be quite some time before the “Clone Saga” went completely off the rails – “Maximum Clonage” and “Time Bomb” always stand out to me as the low point of the whole thing – but “Web of Life” certainly exhibits many of the flaws that would ultimately go on to define this period of Spider-Man; namely a plot that drags out far too long with very little reward at the end of the trail. 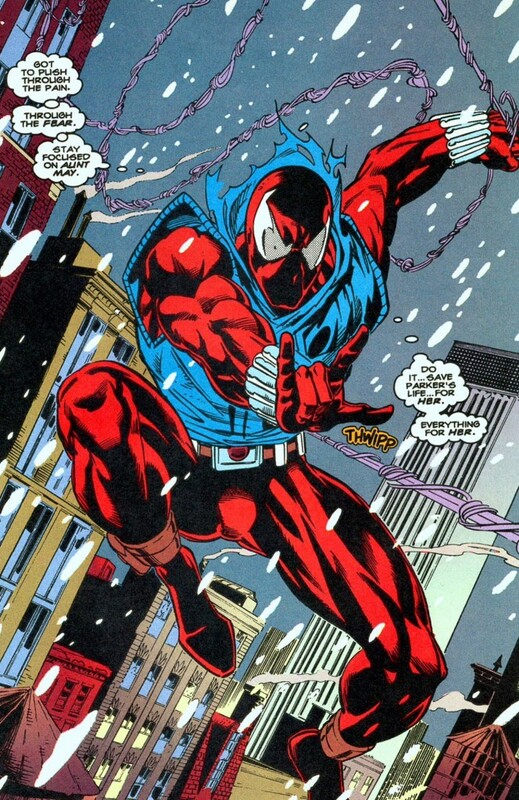 Similar to “The Exile Returns” arc, “Web of Life” focuses primarily on Ben Reilly/Scarlet Spider and runs in Web of Spider-Man (issues #120-121) and “adjectiveless” Spider-Man (#54-55) while Peter’s actions were catalogued in Amazing and Spectacular Spider-Man (I wrote about the concurrent arc, “Web of Death,” a few years ago when the storyline was revisited in Superior Spider-Man/Scarlet Spider). As such, the creative team (Terry Kavanagh and Steve Butler on Web of, and Howard Mackie and Tom Lyle on Spider-Man) really have do a credible job selling Ben as a character. While “The Exile Returns” was a worthwhile “Ben learning the ropes story,” “Web of Life” ends up repeating many of the same character beats. If you think of each of this individual four-issue arcs as having the pacing of one individual issue of a comic book series, it’s not all that unusual for so little to happen in-between installments. And in many ways, that’s exactly how these mini-arcs were written. Unfortunately, we’re talking about four individual issues worth of comics – eight total when you also include the character work from “The Exile Returns.” If you’re still repeating character beats with very little progression after eight issues, you have a serious problem with the narrative. That’s not to say there isn’t anything redeemable here – there are definitely a few moments of intrigue like when Ben clearly has an emotional connection with Betty Brant, thereby providing another hint that perhaps Ben is the original Peter Parker/Spider-Man and not a clone. The scene where Betty is interviewing the Scarlet Spider for the first time is filled with some palpable sexual tension, though if you stop and think about where things were in Peter’s life at the time of the original “Clone Saga” in the 70s, that romantic drama between the two characters might seem a tad misplaced (Gwen had just died and Peter was sorta dating Mary Jane – he and Betty hadn’t been an item in years). Still, as a longerm fan of these characters, I thought it was a nice little callback to the “olden days” of Spider-Man and I especially enjoyed how Lyle illustrated the sequence. But does that actually advance the plot? Of course not. We already got some teases in earlier chapters of this storyline regarding Ben’s inexplicable (but not really inexplicable) connection to Aunt May (how could a clone have feelings … unless he’s NOT a clone, duh). The stuff between Ben and Betty was just more of the same, aka, beats getting repeated in order to dddddrrrraaaawwwww this thing out as long is could possibly go. You can also tell from reading this arc that the creators are trying so hard to sell the mysterious Kaine as someone the reader should be intrigued by. 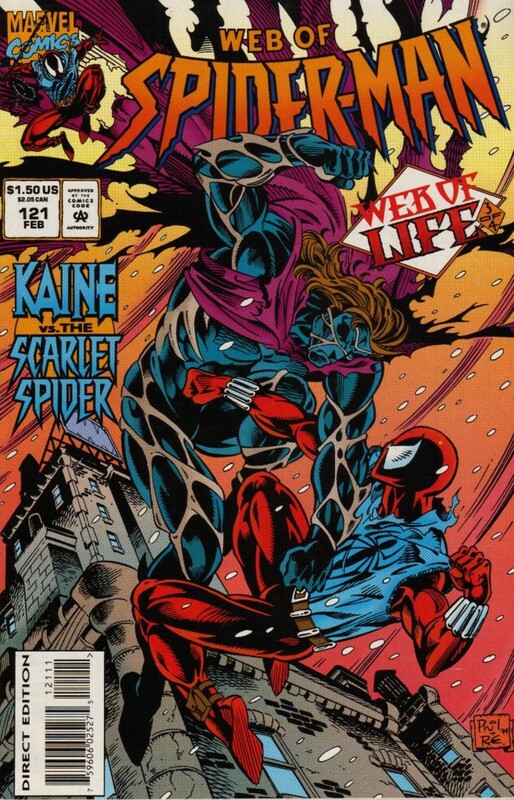 But at this point of the “Clone Saga,” Kaine is just 90s personified – a big hulking figure that leaves a mass of destruction everywhere he goes. Kaine gets into so many fights in these early stories, killing lots of people in the process; it feels so tonally out of place in a Spider-Man story, especially when the big reveal is that Kaine is Peter’s clone gone awry. One would think the creators would have treated him with far more nuance and complexity – and maybe they tried in the way he more or less watches over Peter and Mary Jane, talking about protecting them, but also throwing in there that he was saving them for himself… typical villain speak. And yet, the biggest flaw of “Web of Life” comes in the form of its main villain, Vlad Kravinoff, aka the “Grim Hunter” and son of famous Spidey rogue Kraven the Hunter. 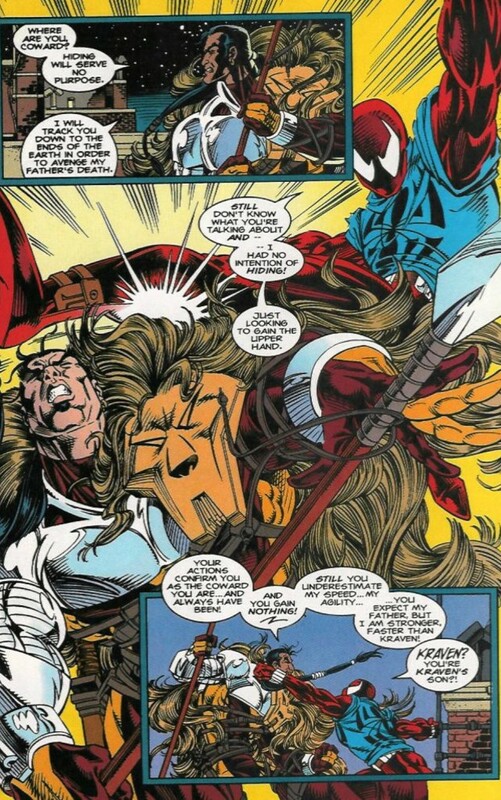 In another typical 90s move, the Spider-creators couldn’t just leave well enough alone and used the “Clone Saga” to test out a pseudo sequel to the all-time great storyline “Kraven’s Last Hunt” by sending Vlad out to avenge the death of his father. Of course, while tracking the “real” Spider-Man, he stumbles upon the scent of Ben, meaning the two of them have to go fight in order to fulfill obligations mandated by the decade this story was written in. Beyond the corny dialogue and the played out fight sequences, Grim Hunter is just a bland character, devoid of any personality. I guess one could have said the same about Kraven until J.M. DeMatteis came along and transformed the villain into a phenomenon. 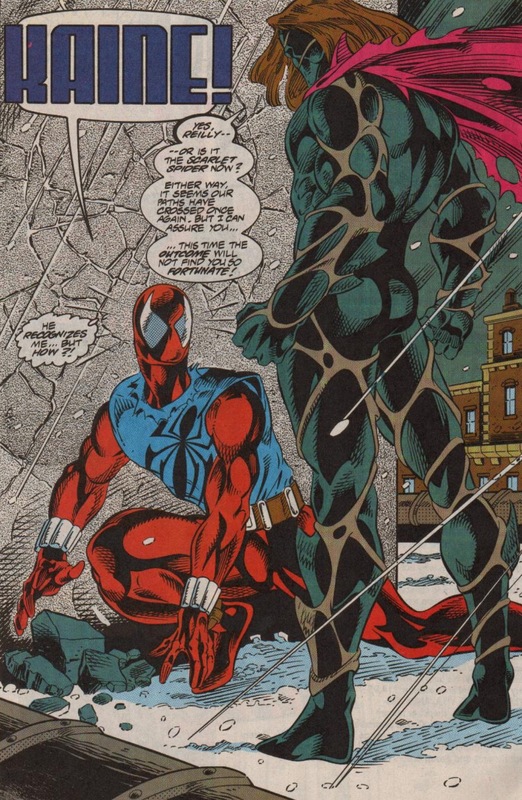 It’s not like JMD wasn’t a part of the Spider-family when the “Clone Saga” kicked off – he was scripting ASM. 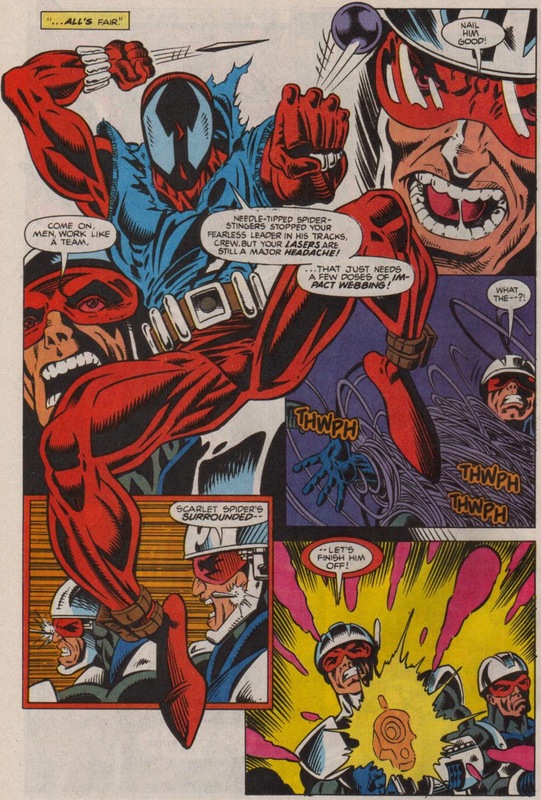 It would have been nice if he had an opportunity to write Grim Hunter but apparently the editorial team wanted something for Scarlet Spider to do, thus, the character’s awkward insertion. “Web of Life” is far from the beginning of the end for the “Clone Saga,” but after reading these stories in real-time, re-reading them again years alter and then reading them one-by-one AGAIN as part of this series of posts, I’m able to relate with some of the frustrations readers had (and still have) with this kind of storytelling. Next time I do one of these, we’ll be hitting the three-part “Smoke and Mirrors,” which brings the Jackal back into the mix. That should be a hoot. Glad you’re continuing with this retrospective! While I know you’re facing a downward spiral quality-wise, it’s great to revisit this unweildy storyline via your easily digestible reviews. As you progress, I’d be curious to read your insights on how specific characters and elements introduced in the Clone Saga were used, abandoned, changed or improved upon in later years – that is, anything good or interesting that ultimately came out of the Clone Saga.